The southerners came back from a goal down to earn a vital point against the Men of Steel. Chennaiyin FC remains the only team in the Indian Super League to have scored in every single one of their home games so far after the brilliant header from Mohammed Rafi which helped the Marina Machans rescue a point late in the game. Both the teams now find themselves in a good position to qualify for the play-offs as the draw does not hurt either side's aspiration to go deep into the tournament. Karanjit had a very shaky game right from the beginning today. Failing to release the ball quicker and after almost mishandling a back pass to him, the Punjabi keeper had faced 2 shots on goal and saved 1. He had 3 catches, 2 punches and 5 clearances to his name. He also made a crucial save in the dying moments of the game to deny Jamshedpur a potential winning goal. Bikramjit looked rather lacklustre today which is quite contrasting to his previous performances. In the first 45 minutes, Chennaiyin were struggling to put together passes and the midfield was not helping the team’s cause. Bikramjit had 2 shots but both were off the mark. He completed 51 passes with 80% accuracy and also put in three crosses with no one to connect it with. He was taken off at the 68 minute mark for Anirudh Thapa. The best defender on the pitch for Chennaiyin today, Jerry put up a fantastic performance. The first half saw the whole team struggle but Jerry held his flank well and nullified any trouble that was to come out of that wing. He had a total of 49 passes at a completion rate of 73%. He had one cross to show for and a huge total of 8 tackles and 8 clearances. German was picked today to replace Dhanapal Ganesh who was serving a one match suspension. Playing alongside Bikramjit who was given freedom to move forward, Germanpreet struggled to hold the midfield by himself for the majority of the first half. He created one chance, he had 71 passes with 73% completion rate and he put in 3 crosses. Defensively, he had 1 tackle, 2 clearances and 2 blocks to show for. A very silent game for the winger this evening. He failed to trouble Yumnam Raju for the majority of the game. He completed 30 passes with 77% of them hitting the target and also had 1 cross to his name. He seemed to be drifting around by himself and it was quite arguably his worst performance in a Chennaiyin shirt. The Mizo Sniper seems to be in a very dark place with respect to his form. The first half from Jeje was one of his worst ever performance in the league this season. He bettered himself in the second half and contributed to his side’s best phase in the match but a miss-pass almost led to Jamshedpur going on the lead. He had 23 passes to show for with only 52% of them making the target. He was the worst player on the pitch today for Chennaiyin. 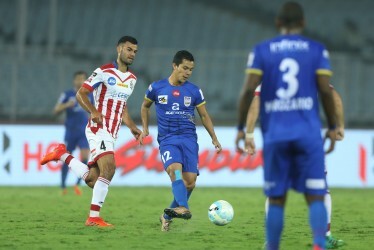 Thapa was brought on for Bikramjit after the hour mark to help replenish the Chennaiyin midfield. He struggled to hit the ground running and was a pedestrian for a large part of the time he spent on the field. He had 17 passes to show for at an accuracy of 65% and also put in an inviting ball into the box only for it to be cleared with ease. Rafi was Chennaiyin’s saving grace today. Came on the pitch for Francisco and played alongside Jeje in a front two. Rest assured, Rafi brilliantly converted a header from a lofting corner delivered by Rene Mihelic. He only had 2 passes to show for and 1 shot on target which resulted in the goal. He was on point today until the very moment the goal went in. 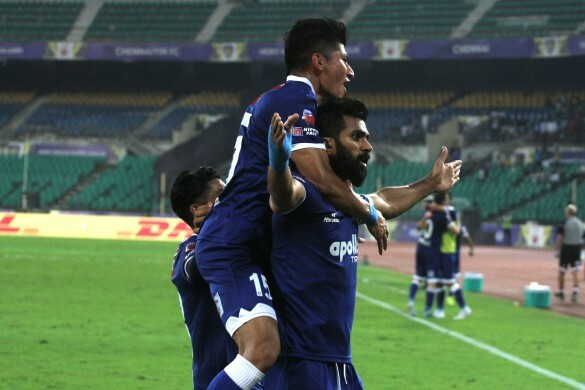 The goal was a result of a corner and Subrata did very well in punching 2 of those out but when he came out for the goal conceding corner, he completely misjudged it and was in no man’s land. He ended the game with 3 catches and 3 clearances. The young forward was quite ineffective down the right wing for his side. Although he created 2 big chances for his side, his threat was completely nullified by Jerry Lalrinzuala. He had 32 passes with a poor accuracy of 47%. He finished his game with 3 crosses, 2 tackles and 2 clearances. The young boy out of Mumbai caused all sorts of problems to Inigo Calderon in the first half but as the game progressed, his impact fizzled out and he failed to help the team. He had 1 shot but it was off target. His passes were off as only 22% of them connected and went on target. He also had 3 tackles, 2 clearances and 1 block to show for. Coming on the back of a long lay-off due to injury, Sumeet Passi put on a great performance today for his team. He worked his socks off for 90 minutes after which he was taken off for Mehtab Hossain. He completed 16 passes with 56% of those reaching the intended target. He added 4 tackles and 4 clearances to his name before he was subbed out. The full-back put on a good show today fizzling out Chennaiyin’s wing play facilitated by Jerry and Gavilan. He completed 24 passes with 75% on target and also mustered up a shot only for it to be off target. He finished the game with 4 tackles, 1 clearance and 1 block. The full-back held his ground well against Francis. His 5 clearances, 1 interception and 3 blocks meant that Francis and Inigo could not easily get past him and create problems. He finished his game with 20 passes at 50% accuracy. Had a solid game and was very unfortunate to concede that goal. Featured in the last 6 minutes of the match when he was subbed in for Sumeet Passi. He played 3 passes in his cameo and made 1 tackle.